Travertine is one of the world’s oldest and most popular building materials. Throughout Europe, signs of centuries-old travertine construction material are virtually everywhere. Even many features of the ancient Roman Colosseum, a top tourist destination, are made from travertine. Interior designers are finding practical and beautiful uses for travertine tile material. Walls, flooring, and exterior coatings are popular applications for modern travertine tile. 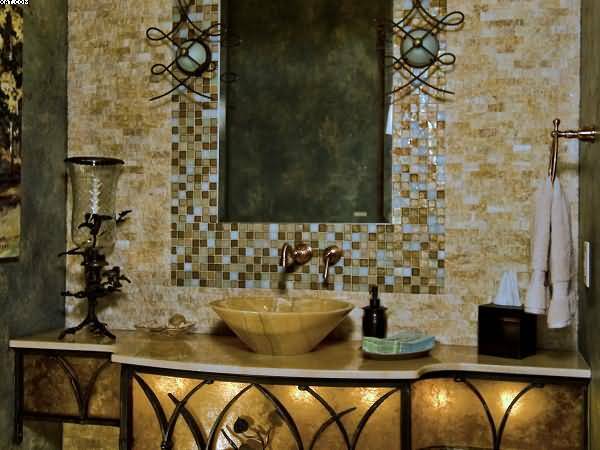 And, for a truly traditional feel reminiscent of the old Roman baths, travertine is particularly popular in bathrooms today. However, while travertine shower walls and bathroom floors are the ultimate in class, extra care must be taken to ensure that lingering water does not mar or alter the appearance of the stone over time. When installed, travertine tiles should be coated with a sealer for protection. Like many natural stone tiles, travertine’s texture can admit soapy water that will dry and leave a soap residue in the fissures of the stone. And, traces of moisture that remain can turn into mold and mildew and eventually weaken the sealant. Bar soaps especially leave these residues on travertine shower tile walls that resolidify in the tiny cracks and dull the finish of the surfaces unless removed immediately. Solution: After each shower, use a soft squeegee to remove the residues before they become permanent residents in your shower and dull the natural beauty of your travertine tile. While this list seems daunting, you should know that you will not need all of these products each time you shower. However, these are useful for maintaining many other types of porous stone tiles and can come in handy when your tile loses its sparkle. Keeping your travertine shower walls looking great is worth applying a few minutes of extra effort each day. After the shower has been used, simply squeegee the stone and glass surfaces and dry to prevent mold. Leave the shower door open for air to continue drying the space. Spray the entire inner area of the shower with EasyOxy or another similar cleaner and then wide dry with the microfiber towels. If you detect mineral deposits, scrub with the stone scrub cleaner. Closely inspect every nook and cranny of the shower area for any additional deposits. Use the appropriate cleaner to dissolve any deposits. For questions regarding travertine or any other natural stone tile products, contact Petra Slate Tile & Stone in Denver. The experts will be pleased to advise you on the purchase, installation, and maintenance of any beautiful natural stone products for your home or business. Phone PetraSlate today at (303)-280-9595.